Cooking Delights: "C"upcakes: It's the missing "C" in A.B.D. These cupcakes were lovingly made by meg and DragonSlayer for all of our phriends on PhinisheD. We felt that, especially at this time of year, Ph.D.'s get too much attention and fuss. All the balloons, all the presents. Really, it's too much. We know the real people in need of celebration are the A.B.D. 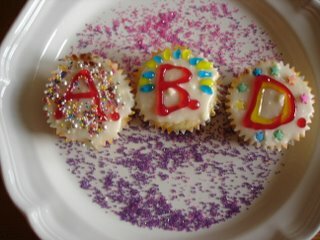 's So, these cupcakes are to celebrate all the A.B.D. 's You guys ROCK!!!!! I love this idea! Cheers to the beautiful cupcakes and cheers to all my ABD friends! TD, if you lived close I would love to have you over to bake. I *love* baking, especially with my friends and phriends. TG, I knew you would understand.